(Reuters) - LeBron James was one of many high-profile players who switched NBA teams during the offseason but all the roster shuffling will do little to cause the reigning champions Golden State Warriors to panic, TV pundits said on Monday. ESPN NBA analysts Jeff Van Gundy and Mark Jackson, speaking on a conference call on the eve of the National Basketball Association's 2018-19 regular season, said despite the rest of the league's best efforts, the Warriors remain the team to beat. "If you gave me a 'you can take the field or you can bet Golden State' option, I'd bet Golden State," said former NBA coach Van Gundy. Since collecting their third championship in four years in June when they swept the James-led Cleveland Cavaliers in the best-of-seven NBA Final, the Warriors added four-time All-Star DeMarcus Cousins to an already potent lineup. Cousins tore his Achilles tendon in January and is not expected to return until midway through the season but when he does he will join a lineup that includes All-Stars Kevin Durant, Stephen Curry, Klay Thompson and Draymond Green. "If Golden State is into it, which they really weren't last year in the regular season and still won 58 games, but if they are into it they are by far the best team with the best talent and will win," said Van Gundy. While the Cousins signing surprised many NBA observers, he was hardly the biggest name on the move. Three-times NBA champion James decided to leave the Eastern Conference for the Los Angeles Lakers but has already said his new team, which have not made the playoffs since 2013, has "a long way to go" until they can challenge the Warriors. The Houston Rockets, who had the NBA's best record last season but fell to the Warriors in the decisive seventh game of the Western Conference final, have since lost two key defenders and critics wonder how veteran Carmelo Anthony will fit in. The San Antonio Spurs acquired four-time All-Star DeMar DeRozan from the Toronto Raptors in exchange for disgruntled Kawhi Leonard, a former NBA Finals MVP who played only nine games last season because of injury. 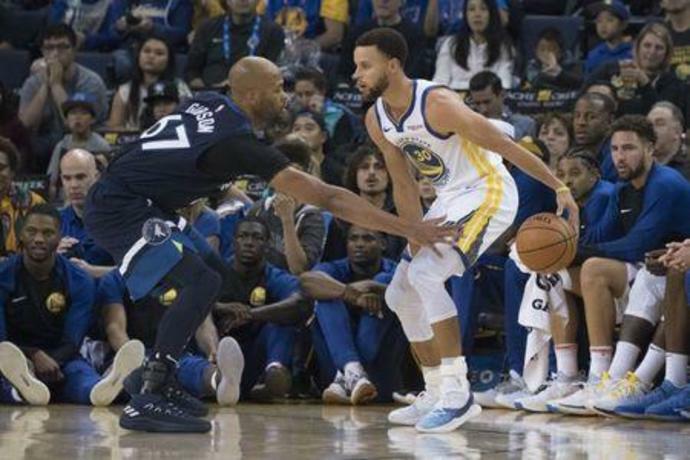 "I do think in this league anything can happen so there's some teams in the Western Conference, if clicking right, if healthy -- injuries plays a role not just for the Warriors but throughout this league, so that can play a part in it," said former coach and player Jackson. "But the Warriors are the clear-cut favorite." OAKLAND - Steve Kerr's latest request of Steph Curry is short, simple and initially puzzling: Let 'em score. Three words, easily understood, but completely against the competitive instincts of an elite NBA player conditioned to accept defense as an essential part of the game. Kerr isn't telling Curry to neglect defense. After the victory, he delivered a fantastic joke while speaking to the media at the podium: The Warriors blew a 3-1 lead in the 2016 NBA Finals and the basketball world will clearly never forget. Andrew Bogut -- who hurt his knee in Game 5 of that infamous series and missed Games 6 and 7 -- responded to Embiid in a column he wrote for Yahoo Sport Australia: Joel Embiid saying the 76ers don't want to do what we did in the 2016 Finals is just Joel being Joel - he's a bit of a larrikin. But they have to get to a Finals series first before they can even think about doing that.